The first effort to establish a township by the name of Amor was made in January, 1879, at which time the county commissioners rejected a petition to organize township 135, range 40 (now Dead Lake township) and township 136, range 40 (now Edna township) as Amor township. No reason is assigned for the refusal to grant the request of the petitioners although it is reasonable to suppose that the commissioners deemed the population too scanty to warrant the creation of the township. However, the name Amor, which in Norwegian means Cupid, seemed to have had a fascination for some amorously inclined Norwegian. On March 19, 1879, a petition was presented to the commissioners, signed by T. Syverson and others, being a majority of the legal voters in congressional township 134, range 40, "praying that the same be organized as a new town to be called 'Amor.' " It is to be noted that this was a different congressional township from the one for which a petition was presented at the January session. The petition was granted and the first election ordered held at the house of S. Larson on Saturday, April 5, 1879. "at nine o'clock in the forenoon and continue till five o'clock in the afternoon of the same day for the purpose of electing town officers and transacting such other business as may be transacted at any regular town meeting." T. Syverson, Frank Munk, August Johnson, J. H. Eller, E. Johnson, John Hult, H. I. Gurgels, Andrew Johnson. Andrew Mortenson, James McNulty, Andrew Breitenbaugh, F. C. Young. O. Lundberg, Iver Erikson, John Shellman, John Young, S. Larson, A. N. Martinson, T. K. Johnson, B. Austin, J. O. Ehler and John Munk. Amor is the center township of Otter Tail county, there being just four tiers of townships on the east and four on the west, by three tiers on the north and three on the south. It is bounded on the north by Dead Lake, on the west by Maine, on the south by Everts, on the south and east by Otter Tail Lake and on the east by Otter Tail township. 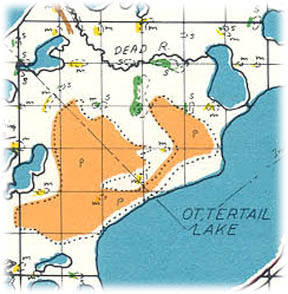 Approximately one-half of Otter Tail lake lies in this township and ten sections are covered by the waters of this lake. Walker lake is the next in size in this township. It lies to the north of Otter Tail lake, has an outlet into the latter body of water. Twin lake and Mud lake are the only other lakes of any size in this township. The farming land in this township is very fertile and productive and although having a very large acreage of water there is little swamp land and the farms are very tillable. There was originally a post-office at Amor but this is now accommodated by a rural route and little remains to mark the town except a few dwellings, church and country store. Vida, in section 4, was once a postoffice, but has long since been abandoned. Camp Nidaros is located in Amor township, section 12, on the shores of Otter Tail lake. It was platted by H. A. Aalberg for F. E. Kaiser and recorded November 4, 1909, in the office of the register of deeds. The present township officers are as follow: Supervisors, F. H. Langvick, J. E. Ritchey and C. O. Hult; clerk, John Lien; treasurer, J. A. Wallin; assessor, F. E. Kaiser; justices, C. Bjorgaard and S. T. Putnam; constables, C. W. Ekman and Osea Sundberg. Places of birth for Amor Township in the 1905 state census.